The cattery of Siberian cats "Adagio"
The cattery works only with cats of traditional color. There are not color-point cats (Neva masquerade cats) in our cattery. 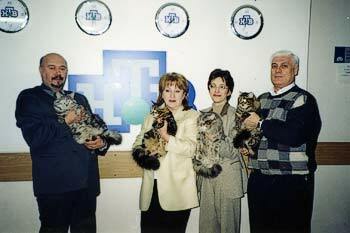 The cattery owner is Tatiana Vasiljevna Mamedova. 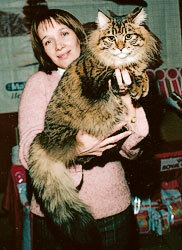 She is the instructor-felinolog, a member of the Union of the Russian cattery owners of Siberian cats. She has 10 years of breeding experience. "Adagio" - in translation from Italian means majestic, quiet, worthy, as our Siberian cats. Successful work of the Siberian cattery is not possible without adherents – the owners of other catteries. Some owners live in Moscow, others in other cities. There are thousand kilometers between us, but our devoted heart and soul to the Siberian breed unites us. Thank you for teamwork, support and understanding. The exhibition for us is a holiday, the opportunity to show the pupils and to share impressions. 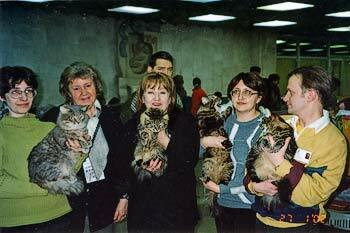 The international exhibition “The Pride of Russia” November, 2003. From left to right: E.Bodnarchuk, the chief editor of magazine « The Cat and the dog » N.J.Dmitrieva, T.Mamedova, L.Ageshina, D.Demidov and our favorite cats. The cats of cattery "Adagio " and their owners are the TV-stars of morning "NTV"-channel program. Many cats had high titles of World Champions and Champions of Europe. I could not believe for a long time, that my cat became “The best representative of the Siberian breed” and also borrowed the honourable 3rd place among all breeds. There were above 550 cats participated in the exhibition. Hortensie received a title of the Champion of Europe. She became the World Champion when she was 5 years old and in this year she was given a birth to her first kittens. Such a way the cattery "Adagio " was set up. 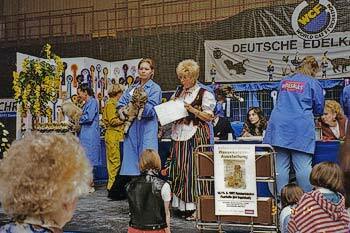 The WCF-president A.Hachman tells about the Siberian breed, Germany, Essen on May, 2-3, 1997. The model is E.Ch. Hortensie Belis. Before to tell about kittens, I would like to say many thanks to Inessa Maltseva the owner of my Hortensie. All three kittens appeared as "stars". Habriella Adagio is the World Champion. Henrietta Adagio and General Adagio are the Champions of Europe. The photo of Hortensie (the home-name is Dasha) with kittens of 2 months old you could see in the Encyclopedia of cats, publishing house "The friend ", 2004. You could also see in the Explanatory dictionary of a cat of E.Lisitsina the same kittens of 9 months old. On a cover of this dictionary is Maksilina Adagio. She is the daughter of Hortensie. All photos on our site are the magnificent work of Natalia Sinitsina and Valery Sinitsin.